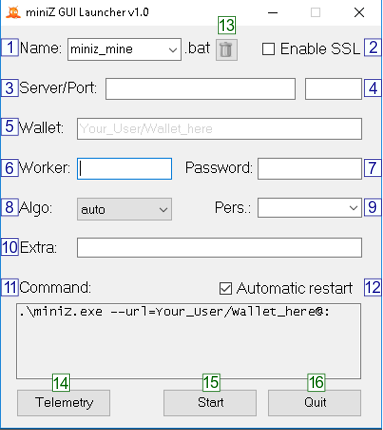 miniZ version v1.2l includes a GUI Launcher that intents to help you through a fast and friendly GPU mining start. 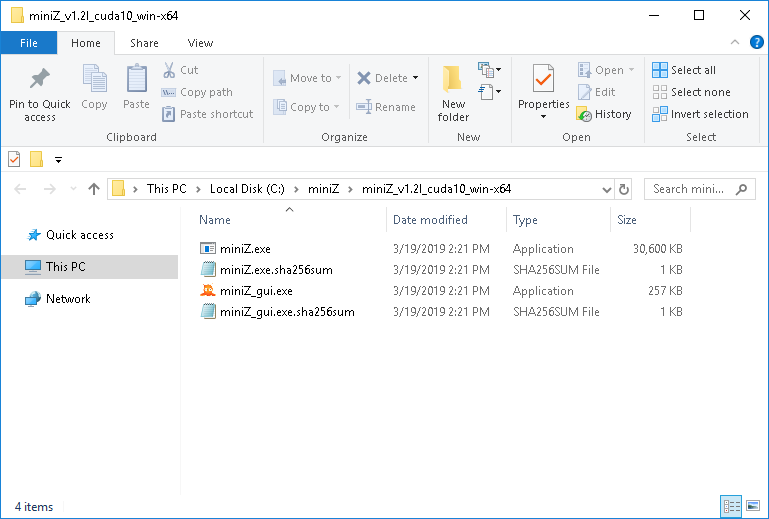 Inside the compressed .zip folder you will find the GUI .exe file and the respective SHA256sum. Name: .bat filename. When starting miniZ the launcher saves the command line to a .bat file. This file is created in the same folder and you can retrieve it in the future. Enable SSL: check if SSL is required. Wallet: write your wallet address, or username, depending on the pool. Password: worker password. Default is ‘x’. Usually not needed, depends on the pool. Algo: open the algorithm dropdown menu: 144,5 192,7 or 96,5. Default is 144,5. Usually not required, depends on the pool. Pers. : open the coin personalisation string dropdown menu. Default is BgoldPoW. Usually not required, depends on the pool. If the required pers. is not in the menu you can use the field to specify as needed. Extra: write here other optional miniZ command line arguments. Command: command line that will be executed in Windows CMD shell when starting miner. Automatic restart: check to enable restart for unvoluntary miner exits. : delete the selected .bat file. Telemetry: open localhost:20000 in your default browser. Start: start miniZ miner. Opens CMD shell and executes the Command (as in 11), plus automatic restart if enabled..
You can easily adapt the following example to other coins and pools. If you need any further help please leave a comment below. You can specify the algorithm in Algo, and the personalisation string in Pers., however this is not necessary in this case. When you click Start button, you may get this message if you have created it before. Click OK to overwrite, or Cancel to change the file name. When you hit the OK button, a Windows CMD shell opens and executes the command line you specified. miniZ starts mining. 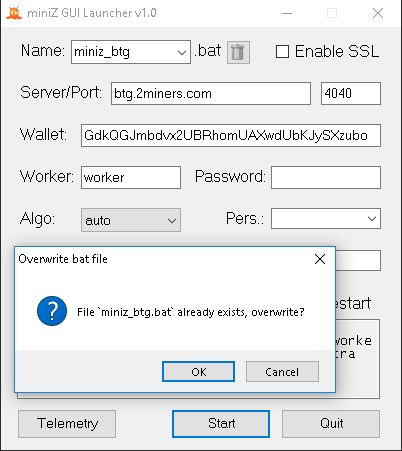 You can see the miniZ_btg.bat file was created in the same folder as miniZ miner. Also, you can find the log file (miniZ.log) there, remember that we wrote --log in the Extra field. That is it! 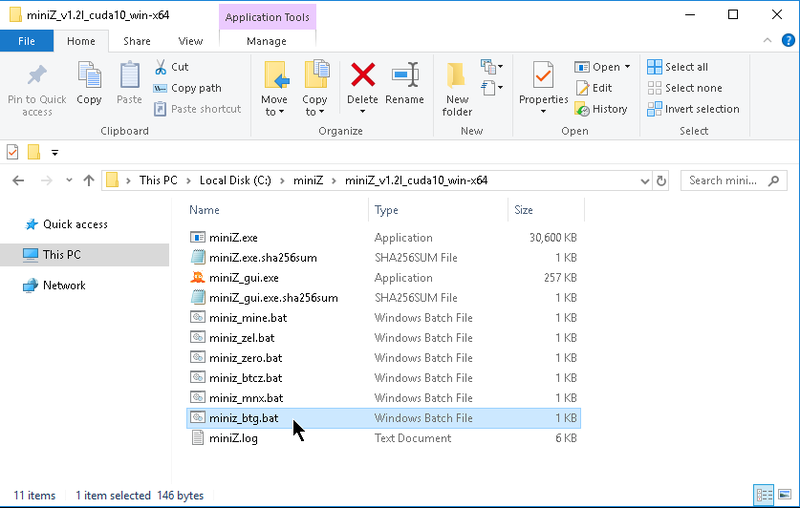 You managed to get your GPUs mining with miniZ GUI Launcher on Windows.